Sometimes, in order to truly appreciate life with modern day conveniences, we have to be reminded of what life was like before them. As an experiment for the last week, I decided to live without the thoroughly modern convenience of the Apple Watch. I was lucky enough to be included in the first group of folks outside of Apple to get an Apple Watch. I’ve been wearing the watch all day, every day since April 1st. Here, I shared my thoughts after my first week. Since April 1st, I have deeply integrated the Apple Watch into my everyday life. I decided to run an experiment and see what a week would be like without the Watch after 85 days of living with it. This is what I learned. The first thing I noticed was my heightened awareness of where my iPhone was at all times. One of my observations from my first week with the Apple Watch was how it untethered me from my iPhone in a positive way. Whether it was in my pocket or on the coffee table or near the front door, the Watch allowed me not to worry about my iPhone needing to be with me at all times to remain connected. Life without the Watch reminded me of the habits I developed to make sure my phone was always near me. I would make sure to always put it in my pocket as I moved around the house or carry it with me from room to room. This behavior is a result of wanting, and sometimes needing, to respond whenever I get a buzz or ding of a notification, whether it is an email alert, text message, or something else. I don’t like the idea of missing something important and this led me to be much more aware of where my iPhone was when I was not wearing the Apple Watch. One of the ways I integrated the Apple Watch into my life was to heavily filter what notifications I allowed to buzz me on the wrist — voice calls, VIP emails, text messages, and only a handful of apps which push me useful information. However on the iPhone, even though I limit the notifications, all of them are treated equally and my phone was constantly buzzing telling me I had a notification. Of course, I check it to see if it is important and needed an immediate response. I had forgotten how much I had to pick up and check my iPhone prior to the Apple Watch. I’d prefer the luxury of reaching for my phone when necessary. Apple Watch helped me achieve this. iMessage notifications were the worst of the bunch. The vast majority of my daily conversations are via iMessage. Prior to the Apple Watch, this would not have bothered me, but the first few days without it and I was irritated by how often I’d get a buzz of a message, reply to it, put my phone down or in my pocket, get another buzz a minute or two later, reply, put my phone down, get a response a few minutes later, reply, put my phone back down, ad infinitum. For the first few days, this really bothered me because a text message conversation is not always one that happens in real time. Sometimes it takes the other person time to reply. I’d rather not stare at my iPhone screen continuously waiting for the person to respond as I find it inefficient and a waste of time. So I put the phone down or in my pocket between messages and continue what I’m doing. The constant pick up, reply, put down sequence frustrated me. With Apple Watch, this process is seamless. Notifications come in reply from the Watch with text or Siri voice dictation and I keep doing what I’m doing. Living without the Apple Watch for a week showed me how much I took this one experience for granted before the Apple Watch. This was the most frustrating part of living without the Apple Watch because of how much I use iMessage to have conversations throughout the day. When I told people about my experiment, many were curious if I used my phone less as a result. For a few weeks prior to this experiment, I had been using an app called Moment, which tracks your iPhone usage each day and how many times you pick the phone up, turn the screen on and look at it. While I didn’t see my iPhone usage in terms of hours per day decline during the week without the Apple Watch, I did see a significant drop in the number of times I looked at it. 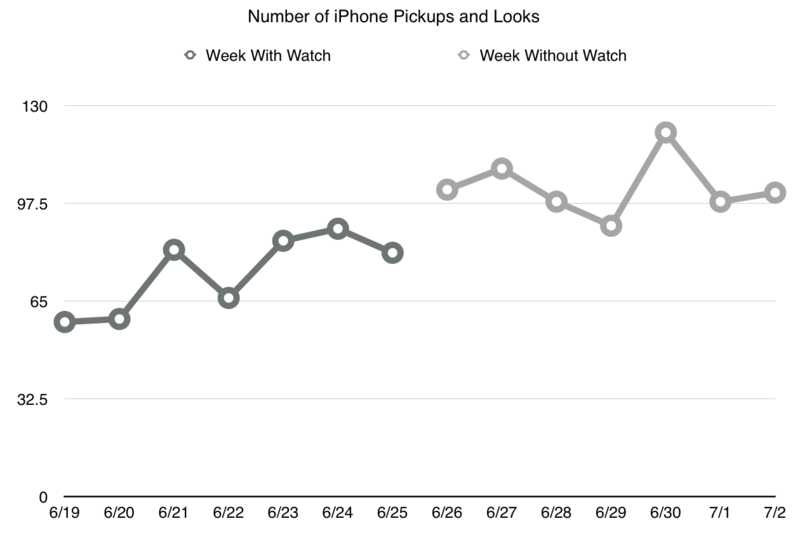 The average number of times I picked up and looked at my phone my last week with the Apple Watch was 74. This last week without the Apple Watch my average number of daily pickups was 102. I charted it to see the difference. When I had the Apple Watch on, I averaged 28 fewer times I looked at my iPhone each day. This is a good proxy of how notifications on the watch help minimize the number of times I need to look at my phone to see the nature of each notification. After reflecting on what looking at my phone fewer times meant in my daily life, I concluded the experience was less disruptive. Don’t get me wrong — I love my iPhone. It is my primary computer. However, having to respond to your phone or pull it out of your pocket or bag for each phone call or text message turns out to be fairly disruptive. As I’ve observed my wife’s behavior as well with her Apple Watch, she articulates similar feelings. As she is out and about, not having to fumble through her purse each time her phone dings is a less disruptive experience in many daily situations. Particularly since not all notifications are important or in need of an immediate response. However, without the use of the Apple Watch, you would not know this without getting your phone out and looking at it. This is an area of immense value that can only be understood once experienced. Interestingly, the same sentiment is noticed by other Apple Watch wearers. I’m working with a company doing research on existing Apple Watch owners called Wristly (if you have an Apple Watch please consider joining our panel) where 32% of respondents said they spend much less time on their iPhone and 58% indicated they use their iPhone somewhat less. So what did I conclude? As I pointed to at the beginning of this article, the Apple Watch is a modern day convenience and should be understood as such. It is a convenience in the same way a dishwasher or washer/dryer or a microwave is. None of the items are absolutely necessary, yet so many of their owners can’t imagine life without one. This is what my week without the Apple Watch taught me. Of course I can get by without it but, given the number of conveniences I’ve been able to quantify in the flow of my daily life, I can no longer imagine life without it.